Our long lasting performance range suits are made in heavyweight, UK woven, low-pill polyester twill. We use high quality fusibles and shoulder pads and have strict seam strength specifications. Fabric & Lining Colours are decided by the client. 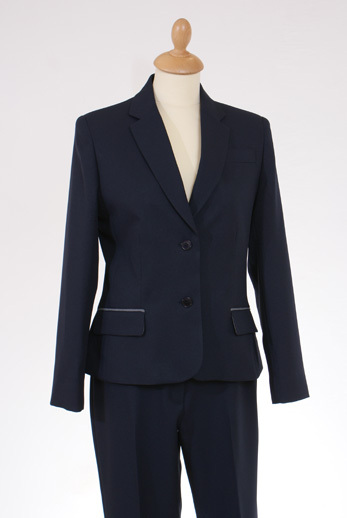 We have many different styles of Girls Suit Jackets for the school to choose from, as well as boys fitted and unfitted styles. All jackets come with an inside open pocket and a strong zipped "pod pocket"
Matching Skirts available in many styles. Badges embroidered directly onto the garment during manufacture if required. Tax tabs can be added to any seam in the jacket, trouser or skirt. All our jackets come with a SMARTSLEEVE® which allows the wearer to easily lengthen the sleeve to a long fit.